Today you’ll find out exactly how to pick your best blue light blocking glasses in 2019. And we mean the best blue light glasses for YOU!! It’s buying glasses online made easy! * With JUST ONE click!! – What is blue light? – Why blue light affects some people more? – What are the best blue blocker glasses? – Do blue light glasses work? – Do I need blue light blocking glasses? – What are blue blockers? – How do you know how much blue light glasses block? – Do yellow glasses block blue light? – Do blue light glasses have to be yellow? NOTE: This guide is for non-prescription glasses. If you need Blue light blocking prescription glasses click here. There is no way around testing them! You have to put different blue blockers on and wear them for a while. Then you know if they work or not. And which ones work best. – maybe even for most people. That doesn’t guarantee the same blue light glasses will also work for you! – Because your sensitivity to blue light is different. – And likely also your lifestyle. – And your problem with blue light. Your blue light sensitivity is unique. Taking advice on blue blocker glasses from others without testing is risky. 1 – Test by ordering and returning. Eventually, you might find glasses that really work for you. …and miss out on the opportunity to fix your problem. 2 – Borrow blue blockers at a local low vision agency. You should also get qualified and personalized advice there. Consider it! 3 – Use the Blue blocker Test kit [Disclosure: We make & sell it]. We designed the Blue blocker Test kit to be the simplest and the most effective option. – You can use it as glasses or over-glasses. The Tester includes a card-stock frame and 8 different blue light Filters. The Filters are very easy to change. – any possible negative side-effects of different blue blockers available for sale. But, if you want to be methodical: Follow these instructions. TIP 1: Test while doing things you usually do. Particularly those that could be causing your problem. TIP 2: Don’t jump to conclusions too quickly (to avoid the placebo effect). – Rule out Blue light as a cause of your problem. So, you can focus on other possible causes. – Find that one of the kit Filters (let’s call it #X) works best for you. So, it’s time for Step 2. It is as easy as clicking only once. (We’ve done all the hard work for you). You will click on your favorite Filter number. It will take you to Group #X. It’s a review of blue light glasses that will work for you like Filter #X. Because they all match your blue light sensitivity. Like the Filter #X. NOTE: In technical terms it is because all blue blockers in Group #X have spectral transmissions like your favorite Test kit Filter #X.
Spectral transmission is what defines the therapeutic effect of blue blockers. Now you know that blue blockers in Group #X will work for you. You still have to choose between the blue blockers in that Group. TIP 1: Find this info by clicking on the links in the Where to buy glasses online column (on the right). TIP 2: We do recommend Anti Reflective coating (AR) to reduce the veiling glare problem. Disclosure: some of the links in the blue blockers review below are commission links. If you use them for buying glasses online AND buy a product, we get a small commission at no extra cost to you. Thanks! * Most of these sell as Migraine relief or Sleep glasses. They’ll work for you like Filter #0. Even if your problem is NOT migraines or insomnia. * Most of these sell as Sleep glasses or Computer gaming glasses. They’ll work for you like Filter #1. Even if your problem is NOT insomnia or computer vision syndrome. * Most of these sell as glasses for computer or sleep glasses. They’ll work for you like Filter #2. Even if your problem is NOT insomnia or computer eye strain. * Most of these sell as Computer Gaming glasses. They’ll work for you like Filter #3. Even if your problem is NOT computer eye strain. * TheraSpecs sell as Migraine glasses, Fluorescent light glasses, headaches, eyestrain, etc. The glasses below will work for you like Filter #4. Even if your problem is NOT migraines or fluorescent lighting. * Gunnars sell as computer and gaming glasses. The blue blockers below will work for you like Filter #5. Even if your problem is NOT computer eye strain. They’ll work for you like Filter #6. Even if your problem is NOT migraine headaches. * Most of these sell as glasses for computer glasses. They’ll work for you like Filter #7. Even if your problem is NOT computer eye strain. We couldn’t find their spectral transmission profiles. So we cannot match them to your blue light sensitivity. – leave a comment below – to send us a heads up! The science about the impact of blue light on our body is very rich. And complex. Below is a peek into it – made as simple and brief as possible. Blue light is a color in the visible light spectrum. Blue light wavelengths: ~380 – ~500nm. Blue light carries more energy than other visible light colors. Because our eyes face excessive blue light when performing sharp vision tasks. A very unlikely situation in nature. Because often we are exposed to blue light when it is not natural. We need blue light during the day to function well. There is lots of blue light in sunlight. And much less on a cloudy day. You know how difficult it is to be upbeat and cheerful on a dark, grey cloudy day :(. It’s the lack of blue light. But as soon as the sky clears up you feel much, much better! It’s blue light doing it! we become sleepy – or at least we used to (before energy saving lighting and digital screens). So blue light helps our body get in sync with the natural rhythm of day and night. (This is particularly helpful when we need to adjust to a different time-zone). Too much blue light after sundown may lead to insomnia. – neck and back pains, etc. This is why extended hours of digital screen viewing are so tiring (see more on this below). Why blue light affects some people more? – Why different people need different color blue light filters. There may be several reasons why we are not equally sensitive to blue light. Many have to do with how our brain processes light signals. It is complex stuff. Besides, top neuroscientists say it will still take time for them to fully understand it [Measuring and using light in the melanopsin age (2014)]. But we’ll focus on a reason that is one of the best researched. It happened only towards the end of the last century. The scientists finally explained why anti blue ray glasses work for some but not others. With the variability in blue light blocking effectiveness of our Macular pigment [The Visual Effects of Intraocular Colored Filters (2012)]. One of its principal functions is to stop blue light from reaching the macula (or fovea). – somewhere between the two extremes. It is difficult to have macular pigment measured. Except in a few highly-specialized research labs. So, the rest of us (4 out of 5 people) need blue blocking glasses. But not everyone the same strength anti blue light glasses. Or they won’t work equally well for everyone. TIP: We can also try to strengthen our macular pigment. Macular pigment supplements improve it in most people. Let’s see what happens when excessive blue light gets past our macular pigment – to the macula. The macula is a tinny spot on the retina that captures sharp vision images. – Blue light reaches the macula out of focus. So our eyes strain more to see well. – Blue light may damage our sharp vision cells at the macula (as explained by Prof. Beatty in the video). NOTE: We use central vision when viewing digital screens. If you are like most, you use a white background. Yet, to display white lots of blue light must be emitted. Imagine what that blue light does to your eyes! My problem is NOT computer eye strain!? – Age-related Macular Degeneration – AMD (an unproven hypothesis). We cannot look at all these in detail. Unfortunately. What are the best blue light blockers? The best blue blockers are those that match one’s blue light sensitivity. Blue light sensitivity varies from person to person. It is conditioned by blue blocking strength of one’s macular pigment. NOTE: Higher blue blocking effectiveness is not necessarily better. Do blue light glasses work? Blue light glasses do work for about 4 out of 5 people. But their blue blocking level must match each person’s blue light sensitivity. Do I need blue light blocking glasses? You cannot be sure whether you need anti blue ray glasses unless you try wearing them. This is because you cannot know your blue light sensitivity. What are blue blocker glasses? Blue light blocking glasses reduce/filter blue light. They should block blue light more than the rest of visible light. – Without glasses, my eyes take in all 100 units. – WITH blue blocking glasses my eyes only take in 30 units of blue light at 445nm. That’s supposing the glasses block 70% of blue light at 445nm. Such blue light glasses might block only about 10% of the rest of visible light (~500nm – ~760nm). How do you know how much blue light is blocked? You need to look at glasses’ spectral transmission profile. It describes how much light they transmit/block. At each wavelength! The easiest way to grasp spectral transmission data is in a spectrogram. 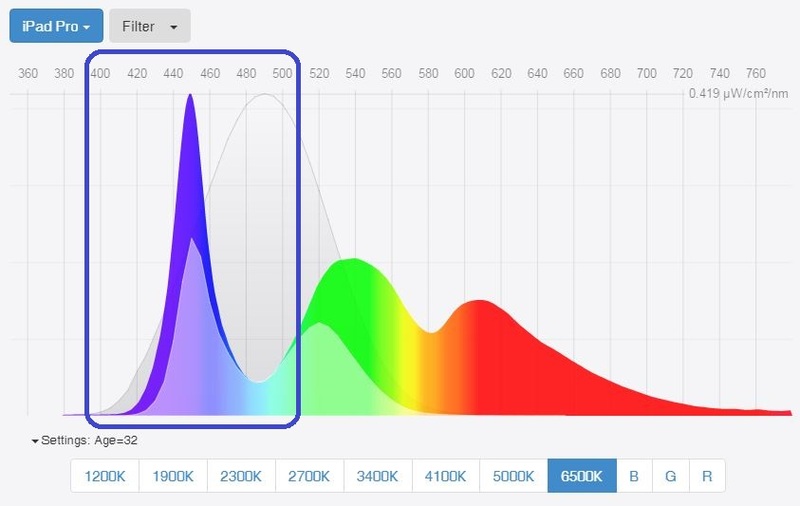 Its curve tells you what is the blue-blocking rate at each light wavelength. The image below explains how to read a spectrogram. 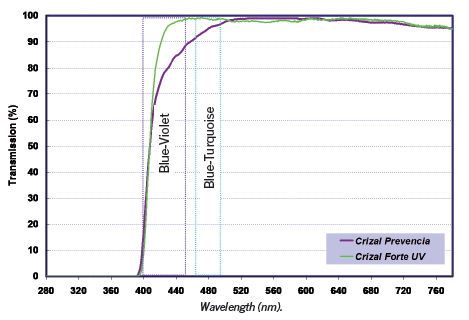 (It’s the spectral transmission profile of pink FL-41 blue block glasses). Do yellow glasses block blue light? Yes, yellow glasses block blue light. You can’t judge their blue blocking range only based on their color. The difference between two yellow filters can be huge. The two filters below are both yellow (see the light grey box under the graph). Note the big difference in how much blue light they block! The same may be true for other blue blocking lens tints. Do blue light glasses have to be yellow? No. Blue blockers don’t have to be yellow. – blue light absorbing monomer – blue blocker lens appear almost clear. Do blue blocker lenses distort color? Yes, they do. You can’t block blue light and see it too. Obvious, right? Find examples of such glasses among the Group #7 blue blockers. – white to orange (or red). Find examples of such glasses among the Group #1 (or #0) blue blockers. – amber glasses are closer to orange blue blockers. Do computer glasses have a prescription? Computer glasses may or may not have a prescription. Their principal property is that they block blue light. – People who need prescription glasses need it also on their computer glasses. – Some people find relief with a small power add to their computer glasses. Even though they otherwise don’t need prescription glasses. Congratulations. Now you know a lot about blue light, blue blockers, and buying glasses online. You are ready to buy your best blue light blocking glasses. Do you find this guide helpful? Do comment on your experience with the Tester. Hi Uroš, thanks for the great info collected in this site. I was gathering similar information to chose a blue blocker glasses when I found your page again. they provide spectograms about it, but for me it seems to be too good to be true. What is your opinion? Unfortunately I did not find spectogram on their site. Hi Peter! Great to hear from you again and thanks for this info. You always have useful hints to share :). The Blue shark optics blue blocker lens seems very interesting. It seems the closest to Stephane’s wish: “I’m still waiting for blue blockers with a sharp cutoff around 450nm…” in the comment below. Principally, because it blocks most light to about 450-460nm. This tends to be where digital screens (and energy saving light bulbs) emit most blue light. Very similar to NoIR #50UV 54% Yellow and Tester Filter #3 (see thistable). Clearly, they do distort color (you can’t block blue light and see it too). But the distortion is focused only on low blue light wavelengths. Stephane, thanks for your comment. Perhaps NoIR #50UV Yellow – see this table. If you want to check what effect such filter will have on you, try our Tester Filter #3. Hi, I have been researching for blue light computer glasses. I found your article very helpful. However, when I looked at how you rank the glasses vendor, I found one big flaw; it does not really tell people how good the blue-light lenses are. A vendor can have thousands of styles, put out spectrogram, with many tints, AR and prescriptions to get a full mark but can offer an extreme lousy blue-light protection. This won’t help consumer like me wanting to buy a good quality blue light protection glasses. You should add an true technical evaluation of their lenses offering. Dividing into 2 categories, light yellow tint vs. amber tint. Because naturally, amber will protect better yellow tint, but it will look awful. (e.g. Gunnar) You need to compare apple to apple and orange to orange. Then in each group, evaluate the % of protection for the most damaging wavelength between 420nm – 450nm and rate them according with 100 pts. This will provide a much better and informative review for people. John, thanks for your comment! I agree with you that there could be many more ways (perhaps better ones?) of evaluating computer glasses blue blocker lenses. In the design of this overview, only objective measures relevant to number of styles and blue blocking characteristics of the lenses were chosen. Spectral transmission is the most objective way of comparing blue-blocking characteristics of different filters (computer glasses). It is also what makes all the differences in preventing blue light associated conditions. Tint is, unfortunately, not as objective. Would it be helpful if in the review of the article, a column suggesting the tint would be added? I understand there are people who also weigh the look/color of the blue blocker lens in addition to its light filtering characteristics. Hi Uroš , as you have mentioned, tint is not objective. There are different tints. The main one would be light yellow and amber.. That will give people some ideas. However, as mentioned, the more objective test would be based on the spectrogram. Once you can somehow classify them into the different tint group, then measure the block % from 420nm-450nm. John, thanks for your suggestions! I forgot to mention the classification of blue light filters in this table (however, it lists all different filters in addition to glasses, moreover, the classification is only based on transmission). See if you find it useful. Great information. I have suffered various amounts of photophobia my entire life, sometimes associated with headaches. I spend a lot of my day in front of a screen or two or three. I just got a new iPad Pro and today changed the screen to utilize their built in blue light protection. I felt some immediate relief but don’t know if it is enough. I wear trifocals regularly, also have prescription computer glasses, I’m wondering if any of the companies you have listed have clip-ons? I’ve seen them from one company, but am not sure if they would be adequate? Also, interestingly my optometrist who I have been seeing for years this year commented that my light blue eyes would put me at increased risk for I think night-time glare. mlaughlinks, please, see this table – among other things it specifies which blue blockers also offer Clip-ons (Flip-ups). Do Felix Grey glasses actually block blue light to a substantial extent? They claim to be transparent and to have no color distortion. On a similar note, are there any glasses that block/filter blue light but have no color distortion (e.g. have a yellow tinge)? Clear = minimal % of blue light blocked (for more see this post). In another words, You can’t block blue light and see it too. However, this doesn’t mean that filters that block little blue light are not helpful – many people find them to solve their problem. So much so, that most of the offering in the market is in this range !?. In the case of Zennioptical would you suggest using their Beyond UV blue blocker clear lenses or suggest against using them if they might deflect UV? And what is the best option for UV blocking only (for plastic lenses)? I mean for day time clear lenses Rx glasses, mainly as a UV protection. If there are better alternatives for this I would be interested too. BEYOND UV blue blockers from Zenni are made with a special blue-light blocking monomer (http://uv420cut.com) from Mitsui Chemicals, a global leader in development and manufacturing of ophthalmic lens materials, that is directly incorporated into the lens. (…) By absorbing blue light, this monomer prevents blue light from passing through the lens to your eye. Based on this information I would say it is safe to say that you shouldn’t have problems with UV and Blue light reflecting from back lens surface back into your eyes. (I haven’t personally tried them, though – so we have to take their word for it). If you end up getting a pair, do let as know whether they reflect blue light or not! Or can anyone else out there comment on it? Unfortunately, I haven’t had a chance to study UV blocking technologies used by the different brands. However, with respect to your other choices for UV protection, you should be safe, as most lenses today block UV light up to 400nm (the UV400 label). But as you attentively noted, you need to also check whether they block UV through absorption or reflection – as done above with ZENNI’s BEYOND UVs. A comprehensive review/comparison of transmissions this type of lenses see the bottom part (near Filter 7) of this table. Thanks Uroš Bole for the detailed answer. In the catalogue of the manufacturer they claim indeed for a full blocking via absorption until 420nn beyond the 400n blocking standart. Now how critical is this extra blocking of 400-420nn? Although It’s not relevant to LED light or sleep problems is it still so valuable for the eye’s health? Yesterday I forgot to include a link to a spectrogram to BEYOND UVs (that they sent to another visitor to this site) – in case you find it useful. To your question: That is hard to say. There seem to be no agreement within the scientific community. – for AMD, until research is more conclusive on what wavelengths are harmful, I would play it safe and try to find glasses that block wavelengths at least up to 460nm. Following this rationale, a cutoff at 420nm (as in the case of BEYOND UVs) is preferable to a cutoff at 400nm. – for visual comfort – to reduce eye strain, that is very subjective, because among many other things (which largely happen in our brain – and are not well researched yet), it depends on how much blue light your macular pigment blocks. That varies a lot from person to person. Many people report relief in digital screen based tasks even with weaker blue blockers than BEYOND UVs. Perhaps they are the majority (I am guessing based on what type of blue blockers seem to be most massively sold in the market – I have no data for this). But there are others who need a cutoff at 550nm or even beyond. Personally, I’d take the extra 20nm of blockage. But you may have other issues (unknown to me) in favor of other alternatives to BEYOND UV with a cutoff at 400nm!? Thanks for the detailed answer! For my (high) prescription it seems there’s no better alternative to Beyond UV so I’ll try them. Now when you talk about cutoffs fo AMD you talk about people with risk factors or as a general prevention? Mory, I am talking about those who were diagnosed with AMD and those who might have some risk factors, for example a parent who has/had AMD. This is a fantastic resource for blue blocking glasses, especially the spectral filtering information. I can only imagine the huge amount of time you put into compiling this. I am using it to select a glasses designed to prevent melatonin disruption before sleep. Thanks for providing this! Jonathan, thanks for your kind words – my wish is the info helps you (and many others) find the right solution. Hi, great info, i wanted to ask about your opinion on Essilor Eyezen, i can only get either gunnars (which are about $300 in my country) or essilor, crizal, etc (the mainstream ones) i’m unable to get jins for instance, tried to order from reading glasses etc but there are power limits so in the end i couldn’t. I noticed smart blue filters out -20%, do you think i could get some releive for eye fatigue and dry eyes with eyezen? Thanks beforehand. wequendi, thanks for your question! I wish I could give you a plain answer, but I can’t :(. Each person vision is specific. Besides, I haven’t been able to find any spectral transmission data for Essilor Eyezen (except: filters at least 20% of Harmful Blue Light from their website. However, it is probably safe to assume that it is not too far from their other products: Crizal Prevencia, or Smart Blue Filter. – 20% is not very much (but I just had a case of a person who finds great relief with another brand of glasses that also filter such a minimal proportion of blue light!?). You could also assume that, if Essilor makes it, it is probably going to be helpful for a great majority of eyes. The trouble is, we don’t know if your eyes belong to that majority or not!? – what is “Harmful Blue Light”? Each vendor has their own interpretation of that ?!? In light of all these unknowns the only way to really know is to try it. But I understand that in your case trying it would cost you quite a lot of money, and you probably can’t return the glasses because they the lenses are tailored to you. It is eyewear (that should also fit over regular glasses), with 8 interchangeable Filters. Each Filter blocks a different proportion of blue light – from very little – just a bit more than a regular, clear lens, to all blue light and more – up to 580nm! Hopefully it is ready by the end of this month – can you wait that long? It will be offered in exchange for what people can/want to give, we’ll see if that is sustainable. (To make the Tester and ship it costs US $10). (If interested subscribe to GLARminY to be notified when Filter Tester is ready). that’s a great idea, thanks, i just subbed. i found two more brans today, one is a local brand and the other one is “seto anti blue ray lenses” http://www.setolens.com/glsten/ShowProducts.asp?id=14 their video says it cuts off 380nm-500nm, 35% blue light and 100% UV light protection. What do you think? wequendi, thanks for this info and question! The spectral transmission of Seto Anti-Blue Ray lenses might be something similar to SeeCoat Blue Premium by Nikon (see spectrogram above) that also filters about 35% of blue light on that interval. (2) the manufacturers try to fulfill the ISO requirements for category 0 ophthalmic lenses, i.e., transmittance of visible light over 80% (the ISO 12312-1:2013 standard applies in the EU, other countries have similar standards. Anyhow, sorry about this long answer – it is not really a digression – I felt it was important to clarify why there might be so many blue blockers that filter relatively small proportion of blue light. But as always, the only way for you to know 100% if a blue blocking lens will help you, is to try it :( … or at least to try a filter with similar spectral trasmission properties :). Does crizal prevencia coating on the back of lens reflect Blue light and UV rays into the eyes as claimed by william stacy in https://youtu.be/KCiTMOd7iEw. karthik: I don’t have first-hand experience with Crizal Prevencia lenses. However, it should be really easy for you to check. Take the glasses/lens, take it outside during the day (best if sunny). Hold the lens at arms-length and look at it from the back of the lens (as you would if looking through the glasses. Do you see a blue reflection on the surface of the lens? If you do, that is blue light reflected by the lens. Under the conditions described in the video you’ve mentioned the lens would also reflect blue light (and UV light) back into your eye when you wear them. I hope that was helpful!? Thanks for the reply. Have you heard of Tokai lutina lenses? It is a japanese company and is available in some countries. They claim that their lenses absorb 94% of blue light between 400 nm to 420 nm. What do you think of their lenses? No, I hadn’t heard about Tokai Lutina lenses. But thanks a lot for bringing up the question!! It is certainly an improvement over regular lenses with a cutoff at 400nm, as shown on the graph above. No doubt those shortest visible wavelenghts carry most energy. 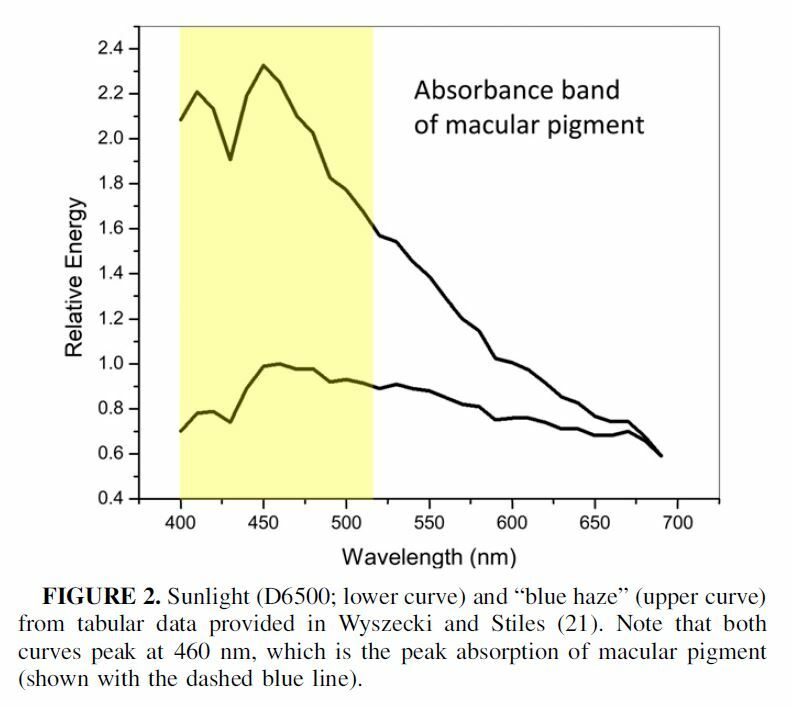 It is therefore not surprising that to match the Sun’s SPD our macular pigment (natural blue light filter placed in the eye, right in front of the macula) peak absorbance is at ~460nm. 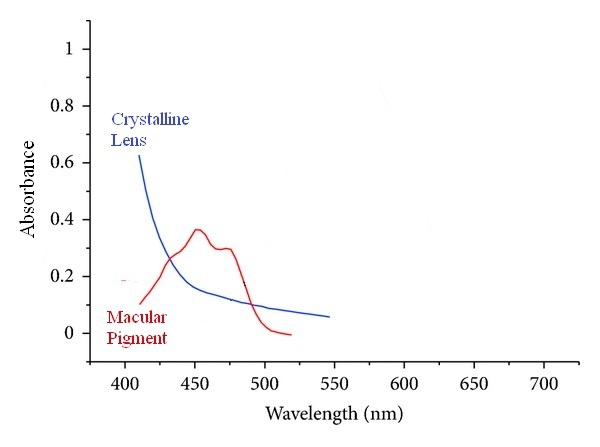 (Note also, that our crystalline lens also helps to block a good proportion of blue light below ~420nm). Now, if you go back to the Tokai Lutina lenses’ spectral transmission curve, you’ll see that at ~440nm its transmittance is above 90% (blocks only 10%) and above 95% by ~450nm. As such it hardly reduces the peak of blue light emitted by digital devices or the Sun. However, to reiterate, Tokai Lutina lens is certainly better than a regular clear lens, if you are choosing between these two. Thank you for such an informative and detailed post. I just ordered the amber Uvex using your Amazon commission link (they’re cheap, stylish, and 2 day shipping). If I don’t like them then I’ll try a more expensive brand. I’m desperate to get eye relief. I work behind a computer all day and I have serious eye pain nearly every day. Jeff, sorry to hear about your eye pain! I know it is a desperate situation. For quick relief I recommend How to reduce eye strain: Treatment with heat and cold. It helped me carry on with my work before I started figuring out all the things I write about here on GLARminY (now I don’t need to do the hot and cold treatment any longer :). Assuming you suspect that blue light has been causing your eye strain, your choice is reasonable. If you are right you are likely to feel immediate relief due to blue light reduction. Importantly, you’ll know blue light is your problem. After some time you might realize you are not completely comfortable with the glasses. This could be because they don’t have Anti-Reflective coating. Then you might be ready for blue blockers with AR. Also note that visual comfort for the more computer light* sensitive is a mosaic of many measures which reinforce each other. There are several more things you can do as described in the posts on GLARminY. I hope blue blockers help you. Let us know how it’ll have gone! And thanks for your support! Nick, thanks for letting us know this. I hope they soon send you the glasses or return your money! Do let us know. Which blue light filter will work best for you. It worked great. Turns out I only need a #7 blue blocker (almost clear). I’ve bought the clip-ons and have been headache free for weeks. Thanks for such a valuable and effective tool!